These Southwest-inspired meatballs are delicious served over rice. Add a mixed green salad drizzled with your favourite RENÉE'S Dressing and dinner is served! Mix meat, dip, bread crumbs, cheese, peppers, spice blend and eggs just until blended; shape into 18 (2-inch) meatballs. Place in 13x9-inch baking dish sprayed with cooking spray. Bake 25 min. or until done (160ºF), topping with salsa after 15 min. Meanwhile, cook rice as directed on package, omitting salt. 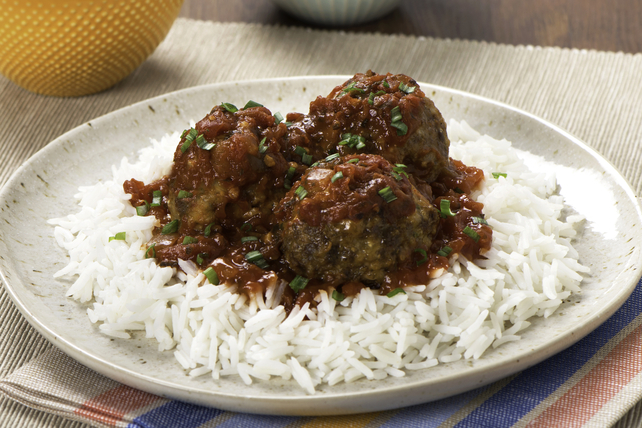 Serve rice topped with meatballs and onions. Prepare using Cracker Barrel Shredded Tex Mex Cheese, and omitting or reducing the Tex-Mex spice blend to 1 tsp. For added heat, prepare using your favourite Cracker Barrel Shredded Cheese, such as Shredded Habanero Heat Cheese.